I have just been reading a review of Greenbelt 2012 by Tony Cummings on Cross Rhythms. Suffice it to say that Tony was not overly impressed. He thought it only a matter of time before GB announced itself no longer a ‘Christian’ festival, and records how he chastised openly gay C of E minister (and former Communard) Richard Coles. He compliments Bruce Cockburn on his music, but regrets lacking an opportunity to correct his theology. The Scriptures have been a light unto my feet wherever I’ve clumsily put them. Put simply, the Bible, all the Bible, is God-breathed. Over the years I’ve had informal chats, often at Greenbelt, with people who’ve called my attitude to the Bible “legalistic” or in more recent times “literalist”. They’ve been hard conversations to conduct in an atmosphere of love. It’s not easy to be gentle and loving when someone’s calling you names and it’s harder still when you’ve come to prayerfully believe that pejorative words like literalist or fundamentalist truly don’t bear any resemblance to what I believe or how I live my life. It seems to me all this theological name-calling, whether it emanates from Bruce Cockburn, Pat Robertson, Martyn Joseph, Dave Tomlinson or thousands more who call Christians deluded charismaniacs, liberal backsliders or post evangelical heretics, are continuing to slander the Church. The love the Bible tells us the Church should have one for another is still elusively far off. This is an opinion piece and I do not intend to dwell on it too much, apart from an interesting exchange between Tony and Robin Vincent. I missed it, but Robin was part of an event at GB entitled Molten Meditation & Soul Circus’ Sacramental Charismania and Tony Cummings had a bit of a go at it all in his article. What I find interesting is that the term “charismatic” used to describe a style of worship is increasingly a red herring. I’ve found the use of the gifts, the move of the holy spirit in every expression of church I’ve come across. This years Greenbelt programme actually had the word “charismatic” all over it describing things like the Blesséd Mass and the Accord Evensong and was ever present in the Rend Collective and Andy Flanagan. There’s a real desire to step up and reclaim the term and demonstrate how my video needs to become an archaic curiosity, a snapshot of what once was – so we can move forward without the baggage. To do that we have to lay the baggage at Jesus’ feet – that’s what I tried to do last Sunday night. Me on a stage with a guitar and a sense of confused excitement. Something is stirring, there is a crackle in the air like electricity. I try to find the wavelength with music, reaching out into what for me is mystery, but into which others all around me are claiming to be directly plugged into- wired in to the God-current. And I hope. I try not to notice all the contradictions. The so called transformational charismatic events that seem to have no lasting significance in people lives. The selective mundanities pasted together to make clear ‘instruction’ from God. The power given to people who claim special gifting, despite their tendency to abuse and wound others. For me and many others, it became impossible to dwell within all the contradictions of this experience and to this day, I struggle to understand what of my experience could be regarded as genuine, spiritual, God-related and how much just manipulated hot air. My working conclusion is that both were present, but in what percentages I could not say. Tony Cummings differentiates between the ‘Charismatic’ and ‘Charismania’. In my many years of immersion within Charismatic churches, I find this distinction very difficult to define. This might be because of my ‘lack of discernment’ (this being one of the spiritual gifts highly valued in Charismatic circles, but totally subjective in application) but also might be simply because these things will always contain both. 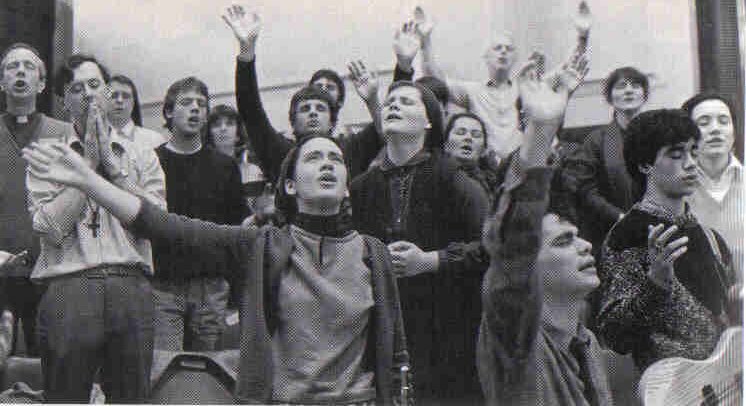 To be an active participant in the excesses of Charismatic worship has to involve a setting aside of any kind of defensive reserves and going with the movement of the crowd. Whether the crowd is being shaped by Spirit of God, or the effect of a few charismatic individuals on the many is always difficult to say, particularly when being swept up in the moment. It is not as if there have not been many warnings of how things can go wrong. Check out this list of Evangelical/Charismatic scandals. The fact that Greenbelt is allowing a debate about this seems to me to be important. As for Mr Cummings, I hope that he remains part of the debate- but hatchet jobs written with Evangelical goggles firmly in place really help no one. This entry was posted in fruit of the Spirit, It's a laugh!, music and tagged bible, charismatic scandals, charismatic worship, cross rhythms, Greenbelt festival, robin vincent, Tony Cummings, worship by Chris Goan. Bookmark the permalink. Does he take evry opportunity to chastise all those he believes to be sinners or faulty in some way. How unlike Christ we Christians often are. One of those moments when something you read crystallises what you have been thinking but been unable to effectively express. Thanks Chris for your thoughts.